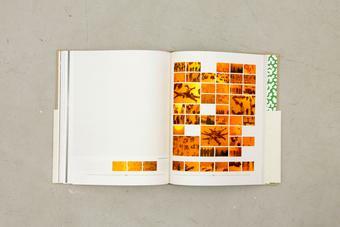 This catalogue was published on the occasion of Olafur Eliasson: Minding the world, the artist’s first large-scale exhibition in Denmark at ARoS Aarhus Kunstmuseum, 2004, curated by Gitte Ørskou. 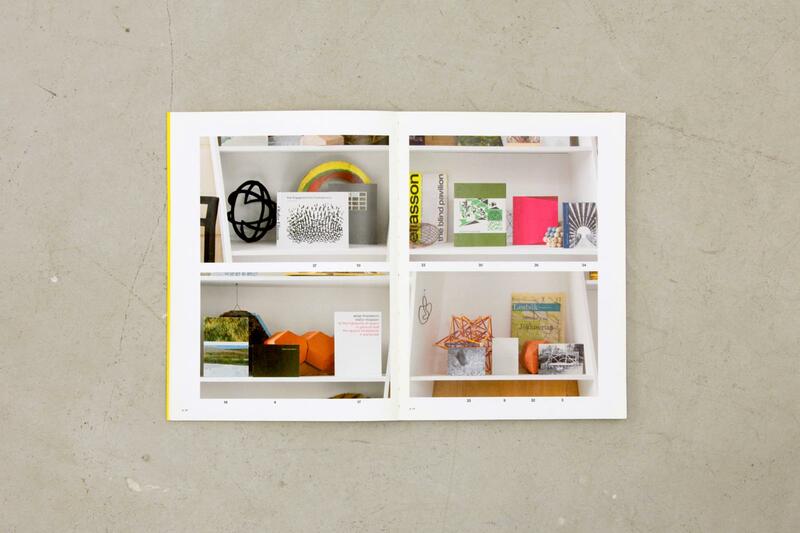 Printed both in Danish and English, it focuses on the spatial composition of eight different exhibitions: Minding the world, 2008; The blind pavilion, 2003; Die Dinge die du nicht siehst die du nicht siehst, 2001; Chaque matin je me sens different, chaque soir je me sens le même, 2002; Your now is my surroundings, 2000; The mediated motion, 2001; The curious garden, 1997; and The weather project, 2003. 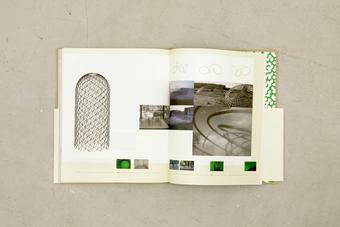 Plans of all the exhibition layouts are shown alongside possible visitor routes traced by hand, and extensive photographic material, sequentially organised. 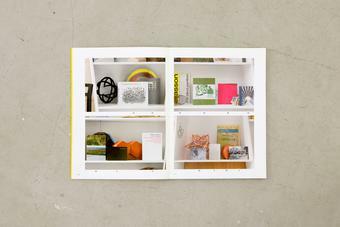 The essays, written by Jonathan Crary, Marianne Krogh Jensen, Lars Lerup, Molly Nesbit, Peter Sloterdijk, Carsten Thau, and Gitte Ørskou, accompany the exhibitions, some more directly than others. 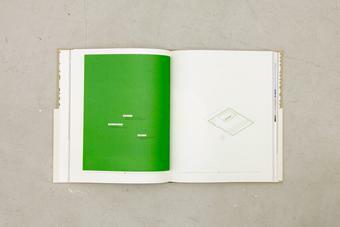 The catalogue is rounded off by an associative image sequence showing works for which movement and space are defining characteristics. 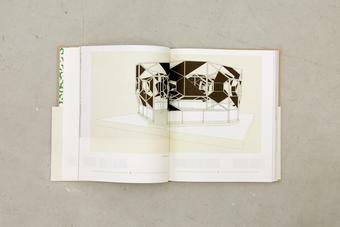 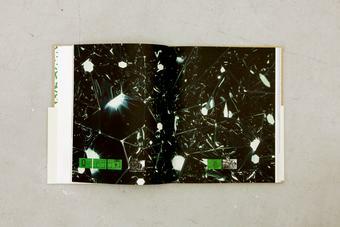 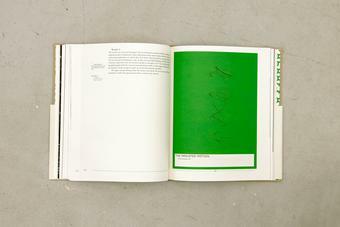 The half-size dust jacket shows black-green-white abstractions of Eliasson’s The blind pavilion, 2003; Remagine, 2002; Flower observatory, 2004; and ‘quasi bricks’. 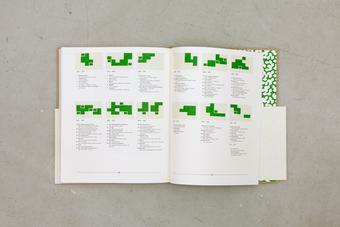 These patterns are also embossed on the linen hardcover. 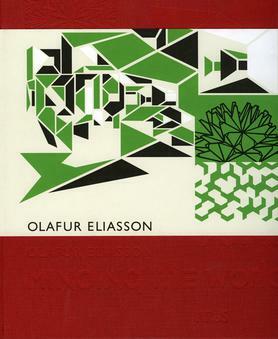 A limited edition with covers in either green, beige, or rust-red was also published. Note: It appears that the English version of Minding the world was printed by three publishers. 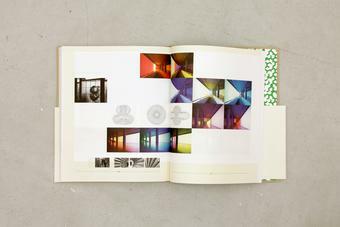 First by ARoS (ISBN: 87 88575 85 3) alongside the Danish edition alongside the exhibition and then by Hatje Cantz (ISBN: 3 7757 1568 1) and finally by Gardners Books (ISBN 3775715681).